Atlantic Salmon is a cultural icon throughout its North Atlantic range; it is the focus of probably the World’s highest profile recreational fishery and is the basis for one of the World’s largest aquaculture industries. Despite this, many wild stocks of salmon are in decline and underpinning this is a dearth of information on the nature and extent of population structuring and adaptive population differentiation, and its implications for species conservation. This important new book will go a long way to rectify this situation by providing a thorough review of the genetics of Atlantic salmon. Sponsored by the European Union and the Atlantic Salmon Trust, this book comprises the work of an international team of scientists, carefully integrated and edited to provide a landmark book of vital interest to all those working with Atlantic salmon. 1.2 Genetics, management and conservation. 1.2 Purpose of this book. 1.3 Organisation of this book. J. Webb, E. Verspoor, N. Aubin-Horth, A. Romakkaniemi and P.Amiro. 2.2 Taxonomy and geographic range. 2.4 Biology of anadromous populations. 2.4.1 Distribution and life in fresh water. 2.4.3 Egg size, development and survival. 2.4.4 Emergence and dispersal of fry. 2.4.5 Free-swimming juvenile life and production. 2.4.6 Sexual maturation of parr. 2.4.9 Marine life and distribution. 2.4.10 Homing and return marine migration. 2.5 Biology of non-anadromous populations. 2.5.2 Life history and behaviour. 3 The Atlantic Salmon Genome. P. Moran, E. Verspoor and W. S. Davidson. 3.2.2 Replication, cell division and growth. 3.2.3 Number and ploidy level. 3.3 Genes and genome organisation. 3.3.1 Molecular nature and structure. 3.3.2 Number and molecular distribution. 3.4.1 Genotypes, alleles and loci. 4 Investigating the Genetics of Populations. M. M. Hansen, B. Villanueva, E. E. Nielsen and D. Bekkevold. 4.2.2 Models of population structure. 4.3.1 How does it differ from population genetics. 4.3.3 Genotype by environment interaction. 4.3.4 Integration of molecular and quantitative genetics. 4.4 The genetic characterisation of wild populations. 4.4.4 Other types of molecular markers. 4.5 Studying populations: issues and limitations. 4.5.1 Types of studies and their limitations. 4.5.2 Mixed-stock analysis and assignment tests. 4.5.3 Estimating effective population size and detecting population declines. 4.6 Future perspectives: going beyond quantifying genetic differentiation and understanding local adaptation. 5 Biodiversity and Population Structure. T. L. King, E. Verspoor, A. P. Spidle, R. Gross, R. B. Phillips, M.-L. Koljonen, J. A. Sanchez and C. L. Morrison. 5.2 Evolutionary relatedness to other salmonids. 5.4 Regional and local population structure. 5.4.1 Spatial scale and boundaries. 5.4.2 Metapopulation structure and gene flow. 6 Mating System and Social Structure. W. C. Jordan, I. A. Fleming and D. Garant. 6.1.1 Definitions, approach and organisation. 6.1.2 Genetic markers in the analysis of mating system and social structure. 6.2.2 Factors affecting the variance in reproductive success of male alternative reproductive tactics. 6.2.3 Reproductive success estimates and mate choice under natural conditions. 6.3.1 Kin recognition and kin-biased behaviour. 6.3.2 Patterns of relatedness in nature and fitness. C. García de Leániz, I. A. Fleming, S. Einum, E. Verspoor, W. C. Jordan, S. Consuegra, N. Aubin-Horth, D. L. Lajus, B. Villanueva, A. Ferguson, A. F. Youngson, T. P. Quinn. 7.1.1 Phenotypic diversity and fitness in a changing world. 7.2 Scope for local adaptations in Atlantic salmon. 7.2.1 Genetic variation in fitness-related traits. 7.2.2 Environmental variation and differential selective pressures. 7.3 Evidence for the existence of local adaptations in Atlantic salmon. 7.3.1 Indirect, circumstantial evidence for local adaptations. 7.3.2 Direct evidence for local adaptations. 7.3.3 Challenges to the local adaptation hypothesis. S. Consuegra and E.E. Nielsen. 8.2 Loss of genetic variabilition in small populations. 8.2.1 Importance of the genetic diversity in natural populations. 8.2.2 Measuring loss of genetic variation in small populations: heterozygosity and allelic diversity. 8.3.1 Minimum effective population size. 8.3.2 Relationship between census and effective population sizes (Ne/Nc). 8.3.3 Factors influencing genetically effective population size in Atlantic salmon. 8.3.4 Calculating effective population size. 8.4 The effects of genetic drift and selection in small populations. 8.5 The effects of inbreeding in small populations: inbreeding depression. 8.6 Population reductions, gene flow and local adaptation. 8.6.1 Small populations of Atlantic salmon and the metapopulation models. 9 Genetic Identification of Individuals and Populations. M.-L. Koljonen, T. L. King and E. E. Nielsen. 9.2.1 Application to Atlantic salmon. 9.3 Identification of population contributions. 9.3.1 Application to Pacific salmon fisheries. 9.3.2 Application to Atlantic salmon fisheries. 9.4 Resolving power of different markers. K. Hindar, C. García de Leániz, M.-L. Koljonen, J. Tufto and A. F. Youngson. 10.2 A historical perspective on fisheries exploitation. 10.3 Fisheries exploitation as an ecological and evolutionary force. 10.4 Fishing and effective population size: the evidence. 10.5 Phenotypic and evolutionary changes in exploited populations. 10.6 Future management of salmon fisheries. T. F. Cross, P. McGinnity, J. Coughlan, E. Dillane, A. Ferguson, M.-L. Koljonen, N. Milner, P. O’Reilly and A. Vasemagi. 11.2 Genetic characteristics of wild salmon populations. 11.3 Nature of strains reared for stocking and ranching. 11.4 Approach based on numbers of salmon present. 11.5 Scenario 1 - Where salmon are extinct in a river (re-introduction). 11.6 Scenario 2 - Where small to near optimal numbers of local population(s) remain (rehabilitation). 11.7 Scenario 3 - Attempting to achieve productivity in excess of naturally-constrained production (enhancement). 11.8 Scenario 4 - Mitigation programmes and conservation hatcheries to counter irreversible loss of natural production (mitigation). 11.8.1 Example 1 – Mitigation programme started simultaneously with the introduction of the constraint to salmon production. 11.8.2 Example 2 – Genetic considerations when the ranching programme begins some years after the construction of the dam and when a large proportion or all of the upstream genetic legacy has been extirpated. A. Ferguson, I. Fleming, K. Hindar, Ø. Skaala, P. McGinnity, T. Cross and P. Prodøhl. 12.2 Magnitude of farm salmon escapes. 12.2.1 Identifying escaped farm salmon. 12.2.2 Escapes from sea cages. 12.3 Genetic differences between wild and farm salmon. 12.3.2 Differences due to domestication. 12.3.3 Genetic marker differences between wild and farm salmon. 12.3.4 Phenotypic differences between wild and farm salmon. 12.4 Potential impact of farm escapes on wild populations. 12.4.1 Fate of adult escapes. 12.4.3 Indirect genetic effects of farm escapes. 12.4.4 Direct genetic effects of farm escapes. 12.5 Breeding of escaped farm salmon in the wild. 12.5.1 Evidence for breeding of escaped farm fish in the wild. 12.5.2 Differences in breeding behaviour of farm and wild salmon. 12.5.3 Increased hybridization with brown trout as a result of farm. 12.6 Experimental studies of the impact of farm escapes. 12.7 Discussion of genetic implications of farm escapes. 12.8 How can the genetic impact of farm escapes be reduced?. E. Verspoor, C. García de Leániz and P. McGinnity. 14 Live Gene Banking of Endangered Populations. P. O’Reilly and R. Doyle. 14.1.1 Genetic concerns associated with the long-term captive rearing of salmonids. 14.1.2 Impact of long-term genetic changes on captive populations. 14.2 Live gene banking of inner Bay of Fundy Atlantic salmon: a case study. 14.2.1 Collection of founder broodstock. 14.2.2 Captive rearing of broodstock. 14.2.4 Captive rearing and river release of offspring. 14.2.5 Ongoing founder broodstock collection and. recovery of wild-exposed live gene bank salmon. 14.3 Conservation and management of small remnant populations of Atlantic salmon. 14.3.1 Prioritising rivers for conservation measures. 14.3.2 Should very small populations be combined or managed separately?. 14.4 Use of cryopreserved sperm in the conservation of Atlantic salmon. 14.4.1 Methods for the cryopreservation of milt. 14.4.2 Use of cryopreserved milt in the restoration of wild salmon populations. 14.4.3 Addition of genetic variation to impoverished future populations. 14.4.4 Minimising genetic change between founder and subsequent generations of live gene bank populations. 14.5.1 Monitoring the loss of genetic variation and accumulation of inbreeding. 14.5.2 Identification of individuals, and evaluation of the relative efficacy of alternate management strategies. 15 Atlantic Salmon Genetics: Past, Present and what’s in the Future?. 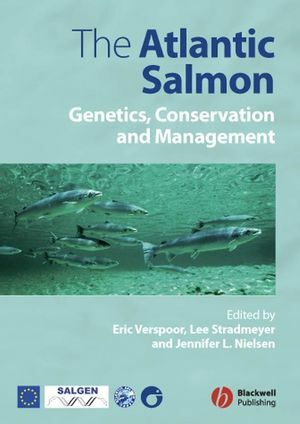 'One of the main objectives of this book was to discuss the latest developments in salmon genetics, conservation and management in a comprehensible manner as far as non-geneticists are concerned. This objective has been achieved and achieved well.